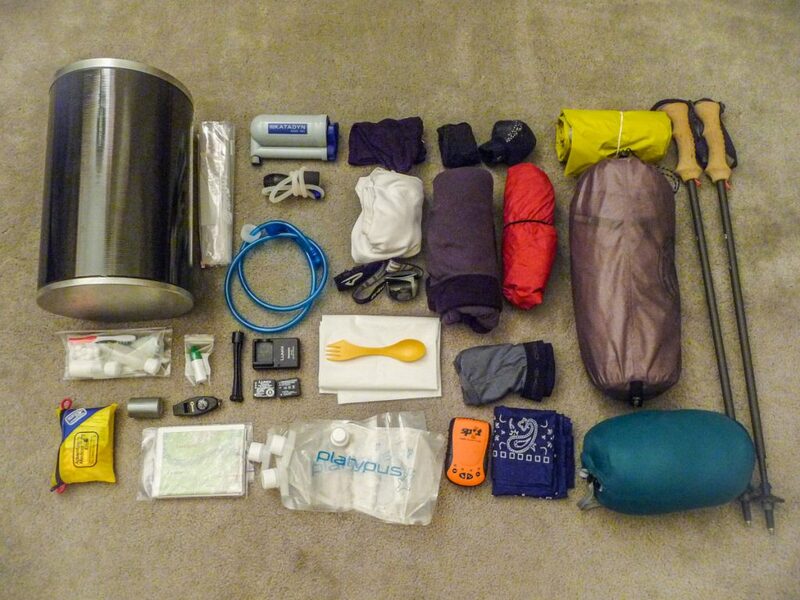 This is my final packing list for the John Muir Trail. This is my planned diet for each day. It doesn’t mean that I ate exactly 4 ounces of dried fruit or 2 ounces of cheese everyday, but it ended up averaging about that. The table below describes the food I brought to begin the trail, and the food I sent and picked up at each resupply point. The weight for each item is in ounces. The totals at the bottom is in pounds. 1. Did any of the items you listed perform poorly? They all look top of the line but would be curious if anything in particular disappointed you. The Big Agnes Seedhouse SL1 tent had condensation problems on cold nights. Sometimes the moisture would drop on my face from the top of the tent in the middle of the night. I’m not sure if this is something that could be avoided with other similar tents. But in general, I have been happy with the tent. I wish I had taken a down vest or jacket, like the Montbell one I have right now. The Mountain Hardwear fleece wasn’t warm enough for me. I do love the fleece though, I’ve had it for 8 years now and have used it extensively on and off the trail and it still looks like new. 2. I think your sleeping bag is rated to 30 deg (correct if wrong); was it warm enough? On some nights where the temperature was around 32°F or slightly below, no, it wasn’t warm enough. I had to sleep with my fleece and pants on. But this is a person-specific problem. Some people sleep colder than others. As I mentioned above, I suggest bringing a down jacket. For the Sierras in the summer, instead of buying a lower temperature rated sleeping bag, it would be better to buy a 30°F (lighter) one and wear the down jacket to sleep on colder nights. 3. Did you take anything you wish you hadn’t (hiking poles, guide book or other)? No. I was very happy with everything I took with me. The hiking poles were essential, as well as the guide book. An argument could be made about not bringing the water filter, but back then I wasn’t comfortable drinking water that could contain visible particles in them (after treating it with tablets). 4. Did you not take something that you wish you had (trowel, journal etc)? Didn’t really feel the need to have a trowel. The hiking poles did a fine job of digging holes in the ground, although they do take longer than a trowel to get it done. I did bring a journal and wrote in it everyday. Food-wise, I wish I had taken more sweet stuff, especially trail mix. I do wish I had worn the Dirty Girl gaiters though. There’s a lot of small rocks on the trail that get into your shoes and socks, and you have to stop often to remove them. Gaiters would have eliminated the problem. 5. Did the capilene t-shirts block mosquitoes and did you ever wish you had short sleeves? They do make a bit of a difference when it comes to mosquitoes, but they won’t block them off completely. I did not wish I had short sleeves. They long sleeves really help to block the sun, which can be pretty punishing in the middle of the day. It’s nice to not having to apply sunblock on your arms. They also have a tight fit and wick sweat away, so you almost don’t notice the long sleeve on your arms. Also, you could always just roll up the sleeves if you wanted to. 6. It looks like you carried less than a full bottle of jungle juice? was that enough or did you replenish at the resupply points? I only encountered mosquitoes on 3 or 4 spots, and usually only used a few drops of Jungle Juice on my wrist and neck each time. I did send extra to my resupply points, but didn’t end up needing it. You definitely do not need the full bottle. I’d say that 1 ounce should be enough for the whole trail in early September, more earlier in the summer when there are more mosquitoes. 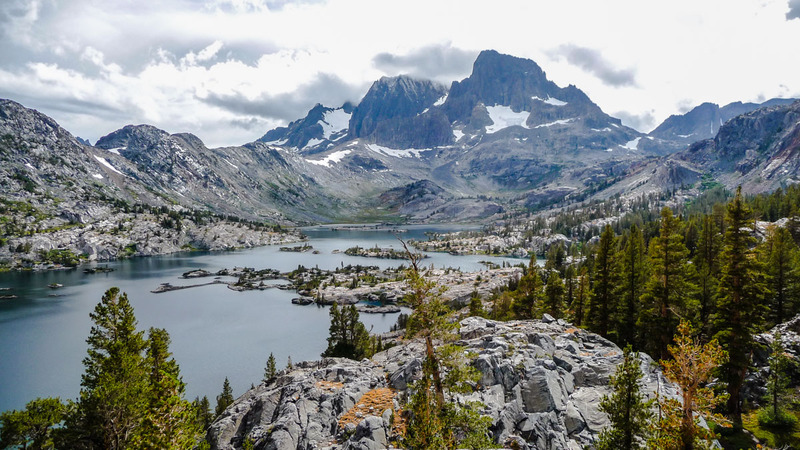 I will be attempting the JMT this August and was wondering which sized Bearikade you ended up taking on your trip (your packing list says expedition but on your planning page it says weekender)? I’m most likely going to rent the canister but am not sure what size is best. Thanks for posting your trip log! Its been fun reading it. Hi Paul. I made a mistake on my planning page, it should say “Expedition”, which is the one I ended up taking. I was able to fit up to 10 days of food in there. Remember to ask for the JMT through-hike fixed rate for the rental, which last year I believe was $55. Where did you rent your bear canister from? If you say Yosemite Valley, did you have to return it back there? I rented it from Wild Ideas. They send the canister to you by mail and once you get home from the hike, you mail it back to them. 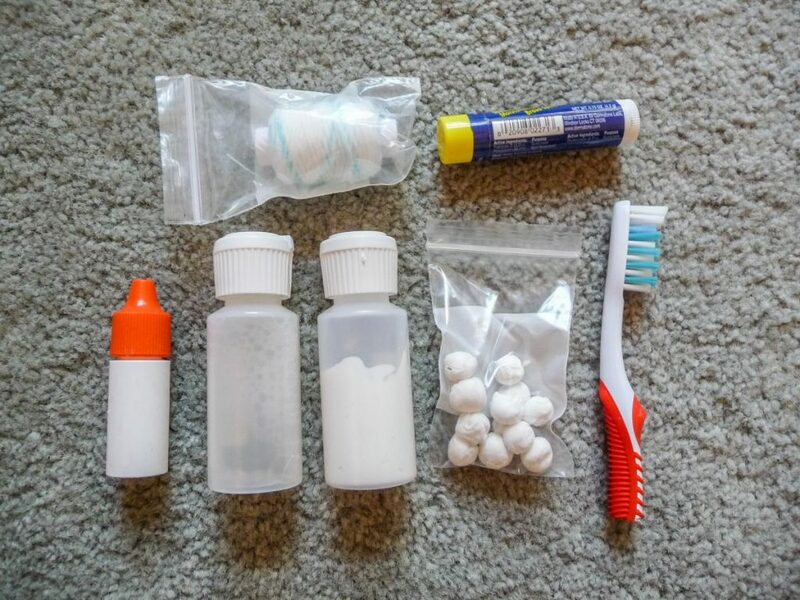 Where did you find dried tooth paste dots? I would like to have that to save space, I am doing the JMT in about 3 weeks. You dry them yourself. Just put small dabs of toothpaste on aluminum paper and let them dry at least 1 week. If you have a food dehydrator, you can also use that too. Kevin, I am preparing for a backpacking trip, have most all the higher quality ultralight equip. and wondered if your filtration system, other than the tablets was worth having along. Is it worth it given the added weight, and how often did you come across water sources? What about any type of repair kit for quick fixes to equipment? Would you suggest bringing along some kind of multi-strand paracord for multiple uses? Any additional suggestions would be helpful as well. Hi Patric. Purifying tables should be enough for the JMT. Alternatively you can get the liquid version of Aquamira too. A filter is not really necessary. Water sources were plentiful on the trail except for a few spots. I didn’t find any water (late August) on the stretch from Little Yosemite Valley to Clouds Rest Trail Junction. If you are doing Half Dome, get plenty of water at Little Yosemite Valley. Another one was between Deer Creek and Duck Pass Junction (about 6 miles), south of Reds Meadow. For the JMT, you really don’t need a cord since your food is stored in a canister. As for repair kits, I only brought some duck tape, but if you use Platypus water containers, you might want to bring some repair patch stickers for them (if you can find them online, I haven’t been able to). If you use an inflatable mattress, you might also want to bring a repair kit for it. Hi Kevin, I just finished reading your entire JMT journal, I found it very inspiring and informative. My wife and I will be hiking the JMT this summer and are just finishing up purchasing all of our gear. I bought a Big Agnes Fly Creek 2 tent and we are trying to decide if we should take the foot print for the tent with us. Did you pack a foot print for your tent? If not, did the tent hold up fine without it? Hi Jamie. Thanks for the comment. No footprint necessary on the JMT. Most camping spots have pretty smooth surfaces, just make sure you clear out any sharp rocks or tree branches. You’ll have a great time out there. We might run into each other. I got a permit to do it again starting 8/22, but still not 100% sure I’ll be able to go. Excellent journal, really enjoyed reading that. Could you tell me where you rented your SPOT messenger and Bearikade from? I rented the SPOT Messenger from http://www.trackme360.com . You should shop around to see if you can fin a cheaper rate. I rented the Bearikade from the manufacturer. Their website is http://wild-ideas.net , it’s best to call them instead of using the web rental form, so they can give you the cheaper JMT rate. 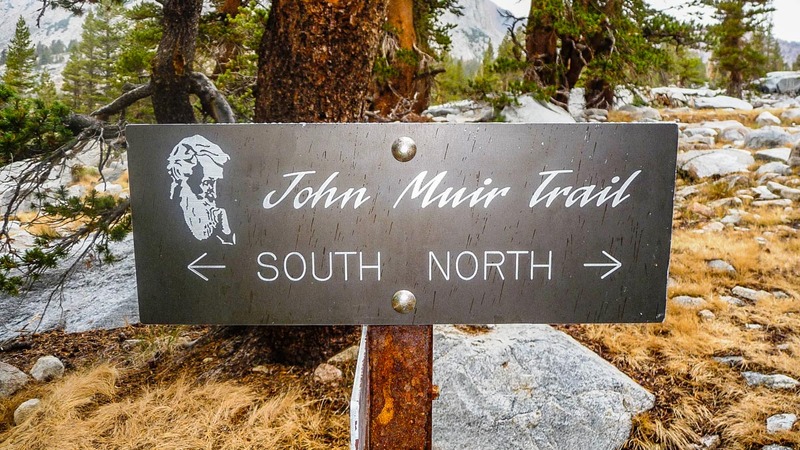 Do you consider the JMT to be easy to follow? Were there any sections that are confusing where you could potentially veer off and take the wrong trail? Did you encounter any spots where the trail seems to disappear or fade away so that you’re not sure which way to go? Hi Kay. The JMT is very well maintained and pretty easy to follow. There are a lot of signs on the trail and if you bring a good map, you won’t get lost. The best map is the Tom Harrison one. The Elizabeth Wenk JMT guidebook also has the same maps inside the book, but they are much smaller and in black & white. These comments were really helpful!! Thank you for taking the time to post them. Awesome site you’ve got. Have a very basic question (from a real beginner here): for a multi-day hike from Glacier Point to Little Yosemite Valley to Half Dome / Cloud Rest, what sort of shoes would you recommend? I noticed you went with a low profile shoe (New Balance 875), but I have been told to look for a mid-height hiking shoes. Hello Wei. The shoes you need really depend on the weight you are carrying. Trail running shoes (like the ones I wore) are comfortable, light, and let your feet breathe. If you don’t have ankle problems, and if you are carrying a light backpack then that would be ideal. If you are carrying a heavy backpack though, then you want something that offers you better stability, like mid or high hiking shoes. Having tried trail runners now, I personally would never go back to hiking boots again. Thanks much for the advice. Settled on a pair of light weight mids by Salomon. Kevin – great list. This is extremely helpful and thank you for posting. I’m hoping to do this hike in the summer with my son. You mentioned picking up food at various resupply points that you’d sent in advance. Can you please post info on how that’s done? Thanks again. 6. It looks like you carried less than a full bottle of jungle juice – was that enough or did you replenish at the resupply points? I decided to answer them on the main post above, so more people can read it. Let me know if you have more questions. nice list and great info….was your pack big enough or do you wish you had the exos 58? also how did you carry the bearikade? did you strap it to the outside or put it inside? one more question, sorry….i noticed your total weight was 35lbs and the exos is rated at 30lbs max….was the pack uncomfortable because of this? Hello Ray. My backpack space was more than enough even considering that I carried the big Bearikade inside it. I didn’t strap anything outside my backpack. I also didn’t use its top lid, which removes 2-3 liters of space, so in total I had about 43-44 liters. I think the key was that my sleeping bag and pad took very little space when packed, and I didn’t have to carry any cooking gear/fuel. For most of the trail, the backpack was carrying somewhere between 15-25 lbs, and was totally fine. The day I picked up my 10-day resupply at Muir Trail Ranch was a miserable day because of the weight. I really really struggled that day. I assume a lot of it had to do with the backpack not handling that much weight very well, although I’m not sure to what extent a a backpack designed for more weight would have made a difference. Thanks for answering my question Kevin……You have given me some good tips. Hi Kevin, great site. I’m currently planning a JMT thru for late July. I keep deliberating over warm clothing tops, insofar as how much I should bring. So far I’ll be hiking in a mountain hardwear t-shirt, but as for layering at night, I’m planning on bringing a mountain hardwear baselayer that is comparable to a capilene 2 thickness, as well as a patagonia nano-puff (their lightest/thinnest down pullover) and an ultralight rain shell. I also have a 15 degree marmot sleeping bag. Do you think this should be sufficient? Not enough? Overkill? Hi Mark. I think that should be enough. During the day it is hot, you won’t need more than a t-shirt. It does get a little chilly before dawn and after dusk, but your set up should be enough most of the time. If it gets really cold, you can always just start a fire or get into the tent early (at night). 15-degree sleeping bag is more than enough. Good luck and have fun! Hi Kevin, do you think that I can take my dog with me to the trail ? Hi Pablo. Sorry, but I don’t know if this is allowed or not. Hi Kevin. Thank you for posting such helpful, vivid details and photos! I’ve enjoyed reading your blog as I prepare to hike the JMT in the summer of 2017. I could ask you a million questions, but one really jumps out to me. It seems you set an alarm at least once to get up in the morning (I know I read that the morning you went up Mt. Whitney). However, I don’t see anything on your packing list that has an alarm. What did you use? Did you have a clock? I’m hoping to combine an alarm with any other technology I can while trying to keep my pack light. I’ll probably bring an iPhone for alarm/time/photos, but I realize that also means a solar charger & cord. Any advice would be greatly appreciated. Thank you! Hi Trevor. I had a cheap digital watch with me. It was my only way to tell the time. I didn’t have a smart phone in back in 2009 when I did the JMT. Phones are fine for photography and for weight saving, but like you said, you’ll need to bring a solar charger. The other alternative is to bring a digital camera with multiple batteries, and a watch like I did.